Saturn’s moon Titan is home to seas and lakes filled with liquid hydrocarbons, but what makes the depressions they lie in? A new study suggests that the moon’s surface dissolves in a similar process that creates sinkholes on Earth. Apart from Earth, Titan is the only body in the Solar System known to possess surface lakes and seas, as seen by the international Cassini mission. But at roughly –180°C, the surface of Titan is very cold and liquid methane and ethane, rather than water, dominate the ‘hydrological’ cycle. Indeed, methane and ethane-filled topographic depressions are distinctive features near the moon’s poles. Two forms have been identified by Cassini. There are vast seas several hundred kilometres across and up to several hundred metres deep, fed by river-like dendritic channels. Then there are numerous smaller, shallower lakes, with rounded edges and steep walls, and generally found in flat areas. Many empty depressions are also observed. The lakes are generally not associated with rivers, and are thought fill up by rainfall and liquids flooding up from underneath. Some of the lakes fill and dry out again during the 30-year seasonal cycle on Saturn and Titan. But quite how the depressions hosting the lakes came about in the first place is poorly understood. 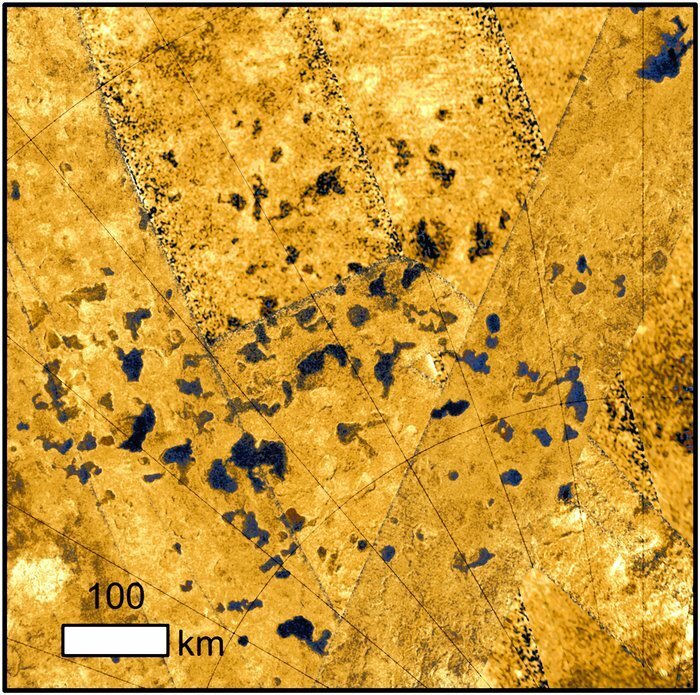 A team of scientists have turned to home for the answer and discovered that Titan’s lakes are reminiscent of ‘karstic’ landforms seen on Earth. These are terrestrial landscapes that result from erosion of soluble rocks such as limestone and gypsum in groundwater and rainfall percolating through rocks. Over time, this leads to features including sinkholes and caves under humid climates, and salt-pans under more arid climates. A team lead by ESA’s Thomas Cornet calculated how long it would take for patches of Titan’s surface to dissolve to create these features. They assumed that the surface is covered in solid organic material, and that the main dissolving agent is liquid hydrocarbons, and took into account present-day models of Titan’s climate. The scientists found that it would take around 50 million years to create a 100 m-deep depression at Titan’s relatively rainy high polar latitudes, consistent with the youthful age of the moon’s surface. “We compared the erosion rates of organics in liquid hydrocarbons on Titan with those of carbonate and evaporite minerals in liquid water on Earth,” describes Thomas. “We found that the dissolution process occurs on Titan some 30 times slower than on Earth due to the longer length of Titan’s year and the fact it only rains during Titan summer.